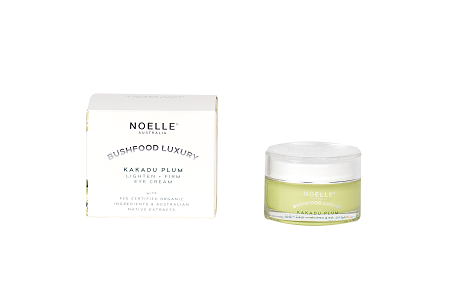 Noelle Australia organic skincare with Kakadu Plum. 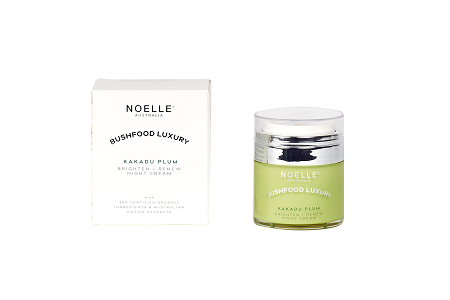 The Kakadu Plum is a native extract packed with unmatched natural Vitamin C and skin refining phytoactive compounds. Aimed at smoothing the texture of skin. To work on reducing the appearance of aging, improve elasticity and enhance radiance. This treatment cream aims at further boosting the skin with targeted antioxidant-rich Australian Native Extracts for visible age defying actions. I have been using both the night cream and eye cream over a few weeks. This is a lightweight cream not heavy in any way, which makes it ideal for even a young skin. If you are looking for long term protection, this light weight treatment range is perfect. Packaging for the night cream has its own pump dispenser which is perfect for products that contain Vitamin C, not only to keep the product stable but for hygienic purposes as well. For men, this is a superfood for the skin they will enjoy using. The first point is that the fragrance is it no way feminine, or fragrant. The scent if very neutral, a clean and easy design cream, that any man can use with ease. The night cream absorbs so well to a matt finish. Most men like to use treatments that they feel are in no way greasy on their skin. Also, as this is so light weight, using Noelle Australia is excellent if you are traveling to a humid climate. The Kakadu Plum originates from the Northern part of Australia, it is very much at home in any type of weather. This plum grows to the size of an olive or cherry and is popular in jams, preserves, sauces and even ice cream. But this tasty fruit has a hidden super power: It has the highest recorded levels of vitamin C of any plant in the world. Kakadu offers 4.7 times more antioxidants and 10 times more potassium than blueberries. This fruit truly is a superfood, which we at Era Organics love to use. But why would Nature come up with such a powerhouse? Due to their high concentration of Vitamin C and soothing anti-fungal properties. Kakadu plum is great for every skin type, but particularly those with blemish prone skin, as this fruit is high in antioxidants that work to detoxify and flush out toxins.